Want to keep up with the latest Johnson City Transit News (weather related schedule changes, holidays, and free ride weeks)? See how to sign up below using one of two easy methods. Step 5: A confirmation text message will be sent. Step 6: Open confirmation and Reply Yes (must reply yes to finalize enrollment). 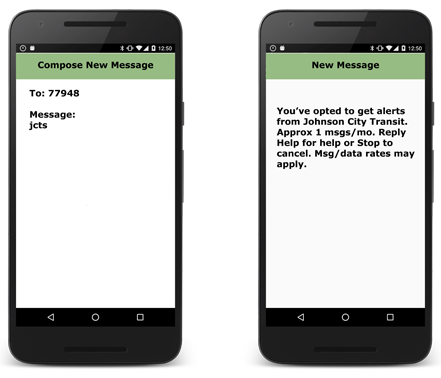 Step 2: On the homepage find "Text Alerts", Enter Name and Cell Phone number. To download the directions click here.